Gov. Mary Fallin delivers her 2016 State of the State address Feb. 1, 2016. Oklahoma Gov. 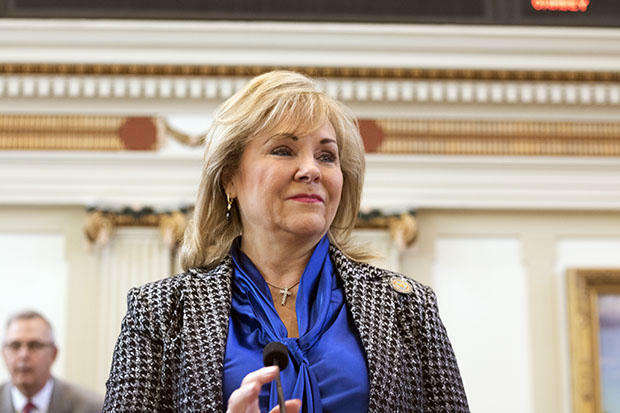 Mary Fallin signed the budget bill that will fund state government for the next fiscal year on Friday. The bill closes a $1.3 billion budget hole by eliminating the double deduction income tax credit and the refundable portion of the state earned income tax credit, tax credit reform such a reduction of the marginally producing oil and gas credit, and the use of one time money and bonding. Lawmakers were able to hold level funding for certain state services, such as corrections and healthcare, but many others took a 5 percent cut. Higher education’s budget was reduced by nearly 16 percent as compared to what was originally appropriated last fiscal year. Common education’s main fund was held level, though the budget cut into the Public School Activities Fund. In a written statement, Fallin said the budget hole was the largest in the state’s history. Fallin issued one line-item veto on the budget bill related to volunteer firefighter compensation coverage premiums. According to a press release from the governor’s office, the state would have inadvertently double-funded compensation premiums without the veto.